Delicata are kind of the "cool kids" of the winter squashes. No need to peel the skin...you can eat it! How fantastic is that? So when you slice and cook the squash they keep their cute stripes and ruffled appearance. 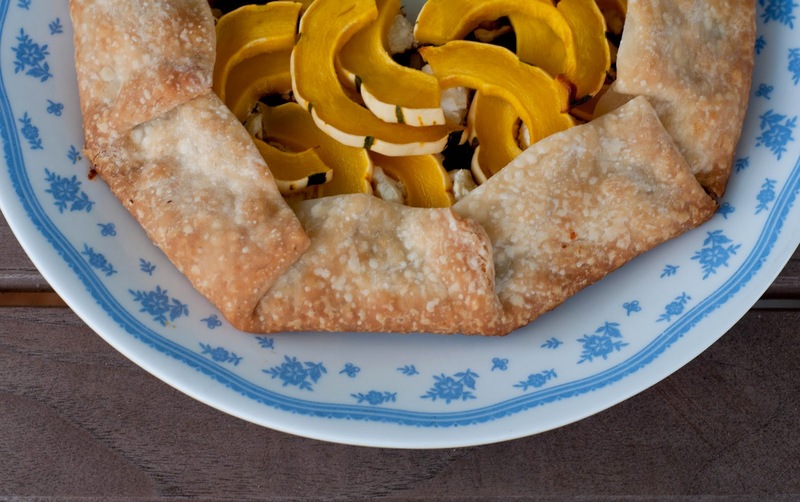 Prepare your pie shell if you're taking the homemade route. Or roll out the pre-made shell onto a parchment lined baking dish. Slice Delicata in half lengthwise. Scoop out seeds and then cut into slices horizontally. Slice onion and add to a pan. Add balsamic vinegar toward the end of cooking. Spread onions on pie shell leaving enough room around the edges to fold it over. Sprinkle generously with goat cheese and then layer Delicata slices on top. Fold over the edges. Bake at 410 for about 30-40 minutes. Test with a knife to make sure the squash is tender before removing it from the oven. Nice! Now I need a use for beets greens.........what do you think?? ?